Is anyone seriously willing to pay nearly $1 million for a Porsche 911 R? It’s well known that the 911 R is the best Porsche for purists. 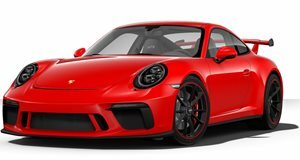 Essentially, it’s a GT3 with a six-speed manual gearbox instead of the automatic PDK transmission, making it one of the most desirable cars in the current Porsche 911 range. Only 911 were made, however, and they all sold out immediately, so it’s also one of the most collectible cars for Porsche enthusiasts everywhere. Consequently, dealers have been cashing in on the demand for the Porsche 911 R and selling them for silly prices. This latest example from Australia is no exception. Listed on CarSales is a practically new Porsche 911 R with a listing price of AU$1.19 million – that’s around $925,000. What’s absurd here is that the original MSRP for the 911R was "only" $184,000, which made it one of the most expensive Porsche 911s ever made. Now it's being valued at nearly six times its original MSRP. This example is decked out in white with green racing stripes, and is said to only have the delivery mileage on the clock. And because it’s being sold in Australia, it comes in right-hand drive. It's probably one of the most pristine examples of a 911 R you'll ever find, but that still doesn’t justify the absurd asking price. You would think that no dealer could possibly think anyone would be prepared to pay that much for a Porsche 911 R. Sadly, this is by no means the only example of the 911 R being sold for a crazy sum of money - dealers asking for nearly $1 million for a 911 R are depressingly common. Suffice to say, Porsche isn’t too happy about the 911 R being treated like a cash cow and wishes its owners would appreciate its merits rather than its value. Will dealers ever see sense?